Randy likes space, robots, and baseball, but he can't ace everything . . . or can he? Chris Van Dusen knocks one out of the park with a comical ode to ingenuity. Randy Riley loves two things: science and baseball. When it comes to the solar system, the constellations, and all things robot, Randy is a genius. But on the baseball diamond? Not so much. He tries . . . but whiffs every time. Then, one night, Randy sees something shocking through his Space Boy telescope: it's a fireball, and it's headed right for his town! Randy does the math, summons all of his science smarts, and devises a plan that will save the day in a spectacular way. Once again, Chris Van Dusen winds up his visual humor, dizzying perspectives, perfect pacing, and rollicking rhyme and delivers a hit to make readers stand up and cheer. Van Dusen's tale is inventive and humorous. Randy is a lovably nerdy genius who is admired for his brains and is part of a team that doesn't seem to mind his poor batting average. Gouache paintings use clean crisp lines and sharp, bright colors in a variety of perspectives. Everything from the cars in the driveways to the living-room décor places the events in pre-computer, mid-20th-century America. A cunning twist on the heroic home run that wins the game. --Kirkus Reviews With all the bases covered-musical text, entertaining artwork, and surefire subject matter-this title bats 1,000 for group or lapsit read-alouds. --School Library Journal Randy may be an easy out with a bat, but his heroism merits a spot at the heart of any budding geek's lineup. --Booklist In this retro rhyming tribute to mind over batter, Van Dusen casts a wide net: anyone who's a fan of nerds, "Casey at the Bat," classic science fiction, or mid-century design should find something to like in these eye-popping pages. --Publishers Weekly Children will enjoy the adventures of a young boy who used his love of baseball to save the day. --Library Media Connection Young Randy Riley has two passions: science and baseball. But he's more of a student than an athlete. As Chris Van Drusen puts it in verse: "See, Randy was a genius;/he just couldn't hit the ball./He struck out every time at bat./He wasn't good at all." But when Randy spies through his "Space Boy telescope" a massive fireball hurling toward Earth, his way with robots saves more than a game. In science fiction, there's more than one way to hit a home run. 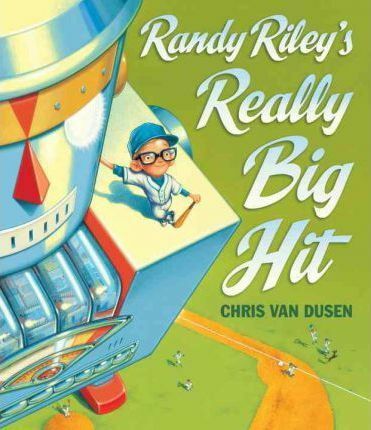 --USA Today Chris Van Dusen's RANDY RILEY'S REALLY BIG HIT won me over at first swing... There's a cool retro feel to this sci-fi rhyming book along with some gloriously comic special effects. It's just scary enough to be a page turner and brings a whole new twist to kids and baseball. --The Boston Globe With a nod to "Casey at the Bat," a dash of science geek, and the impending destruction of the earth, RANDY RILEY'S REALLY BIG HIT has something for everyone.